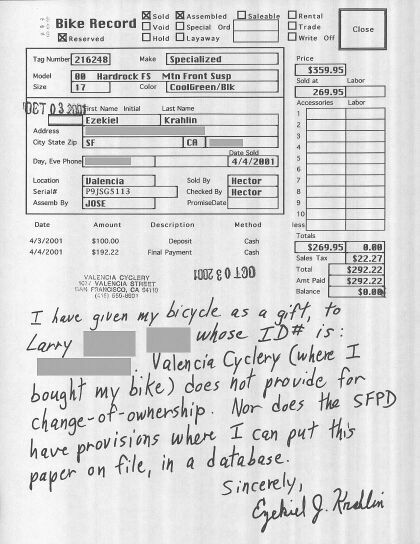 I gave my 8-month old Specialized mountain bike away, as a special gift to one of my street friends, Larry. (Actually, I wanted to make a statement to another street buddy, Troy, by giving my bike away in his presence. But that's another story for another time.) The total value was almost $2,000, when you include the side bags, tools, and other accessories that I added to my prize bicycle. Unfortunately, my goodwill backfired and caused many problems, anger, and grief. To help alleviate any more complications by the police, I had the bicycle shop create the above record. However, other misfortunes ensued, and the bike was finally stolen for good, several months later. Some day, I'll tell the whole story; it's quite a fiasco.